Schematic procedure for using the EpiQuik Global Histone H3K27 Methylation Assay Kit. The EpiQuik™ Global H3-K27 Methylation Assay Kit is designed for measuring global histone H3-K27 methylation. In an assay with this kit, the histone proteins are stably spotted on the strip wells. The methylated histone H3-K27 can be recognized with a high-affinity antibody. The ratio or amount of methylated H3-K27 can be quantified through HRP conjugated secondary antibody-color development system and is proportional to the intensity of color development. Li B et. al. (March 2017). DICER1 regulates endometrial carcinoma invasion via histone acetylation and methylation. J Cancer. 8(6):933-939. Burgess SL et. al. (July 2016). 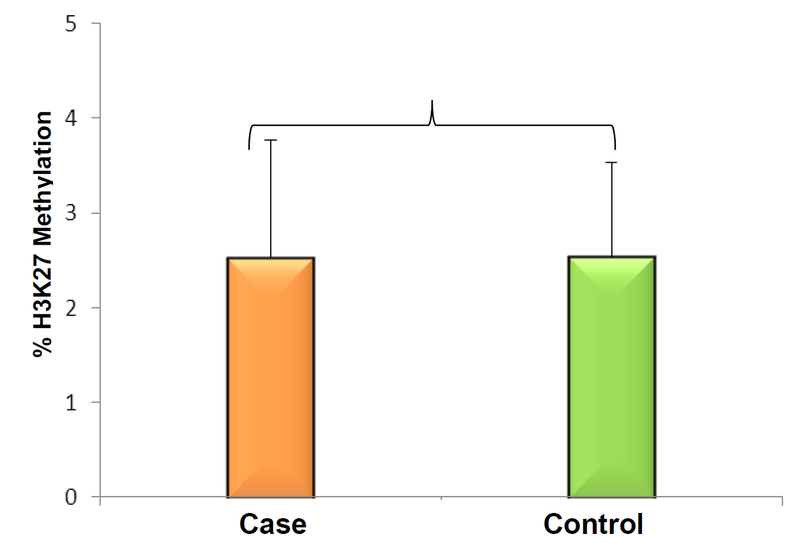 Role of Serum Amyloid A, GM-CSF and Bone Marrow Granulocyte-Monocyte Precursor Expansion in Segmented Filamentous Bacteria-mediated Protection from Entamoeba histolytica. Infect Immun. Badisa RB et. al. (January 2015). N-acetyl cysteine mitigates the acute effects of cocaine-induced toxicity in astroglia-like cells. PLoS One. 10(1):e0114285. Vishnubalaji R et. al. (January 2015). Genome-wide mRNA and miRNA expression profiling reveal multiple regulatory networks in colorectal cancer. Cell Death Dis. 6:e1614. Batra V et. al. (March 2012). Interaction between γ-radiation and dietary folate starvation metabolically reprograms global hepatic histone H3 methylation at lysine 4 and lysine 27 residues. Food Chem Toxicol. 50(3-4):464-72. We analyzed the histone modifications associated with biologic drugs in different time points of the treatment following the manufacturers´ instructions. It is ready to use, easy and fast to perform. The amount of Antibody buffer (GG6) is quite restrictive. The kit does not include enough volume to perform pre-dilutions of the samples. The strip wells do not bind properly to the plate. Therefore, it sometimes causes troubles when you introduce the plate in the Multiskan, causing it to get stuck. When we measured the background of the empty plates that had been at room temperature for at least 15 minutes, we saw that the background was not very homogenous. 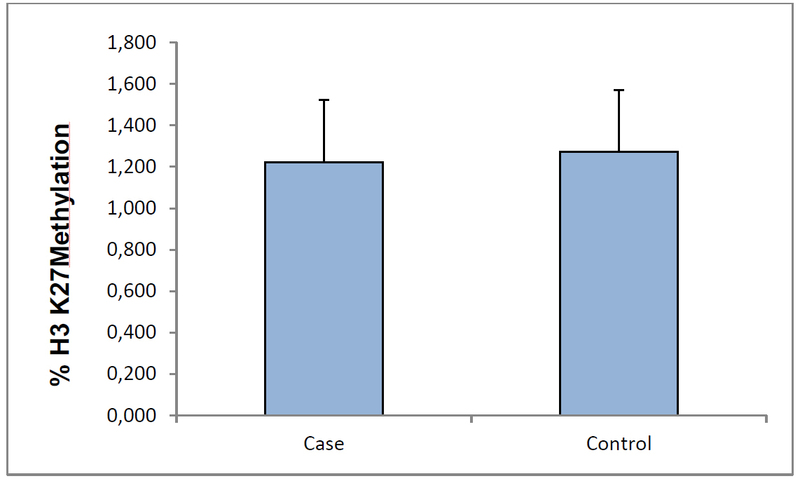 As the expected differences between our case and control samples were quite small, the variability found in the background may mask the specific differences within them. Nevertheless, I think there must be difficult to reduce such variation. It is important to underlie that all materials needed are included in the kit. To carry out the experiments you only need a microplate spectrophotometer and a centrifuge. Differences in the percentage of methylated H3K27 in peripheral blood mononuclear cells of healthy subjects. Differences in the percentage of methylated H3K27 in peripheral blood mononuclear cells. We analyzed the histone modifications associated with biologic drugs in different time points of the treatment following the manufacturers´ instructions. In total, we have already used 4 units of this kit (3020-96) this year. It is ready to use, easy and fast to perform. The user guide was clear and easy to use. The presentation of the product was good. The amount of Antibody buffer (GG6) is quite restrictive. The kit does not include enough volume to perform pre-dilutions of the samples. The strip wells do not bind properly to the plate. Therefore, it sometimes causes troubles when you introduce the plate in the Multiskan, causing it to get stuck. When we measured the background of the empty plates that had been at room temperature for at least 15 minutes, we saw that the background was not very homogenous. 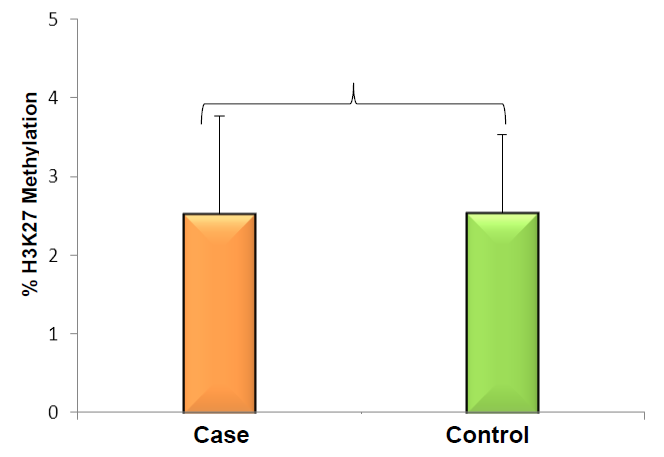 As the expected differences between our case and control samples were quite small, the variability found in the background may mask the specific differences within them. Nevertheless, I think there must be difficult to reduce such variation. It is important to underlie that all materials needed are included in the kit. To carry out the experiments you only need a microplate spectrophotometer and a centrifuge.